What follows is a master list of images of places the 80th came from or visited during its 3 year existence, from August 1862 through July 1865, during the American Civil War. This list is arranged in alphabetical order by the name of the place. Source information for each image is included, as are links you can follow to view these images where they are posted on the 80th website. Definitions: LOC=US Library of Congress Prints and Photographs Division. Pen and ink drawing by H. Mosler shows the 80th in line of battle at the October 8, 1862 battle of Chaplin Hills at Perryville. Illustration is from November 1, 1862, issue of Harper's Weekly. 80th first fought ('met the elephant') there, just 30 days after it received weapons. Entered the fight with 738 soldiers, of which 157 became casualties (wounded, killed or captured). Photo taken late 1863 or early 1864 by George N. Barnard of the strategic railroad bridge over the Holston River at Strawberry Plains. Courtesy of LOC. 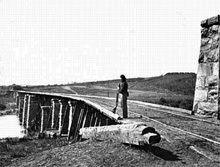 80th was stationed there on September 17-18, 1863 and January 18-22, 1864 before burning the bridge to keep it from being captured. The 80th was there again February 24 to March 11, 1864 and a final brief visit April 22, 1864 when it marched over the re-built bridge. All Rights Reserved. Created December 30, 2004. Last updated January 1, 2005.